Chichen Itza is one of the most visited archaeological zones in the entire world. It is located on the Yucatan Peninsula approximately 70 miles east of Merida. Chicheb Itza is three kilometers by one and a half kilometers in size. It is divided into three parts: the Central Group is the oldest, and the Northern Group is the newest, and the Southern Group is a mixture of old and new. Chichen Itza was founded around 400 AD. It is believed that one culture after another inhabited Chichen Itza. The architecture in Chichen Itza is remarkably non-Mayan, and its origins have long puzzled archaeologists. In fact, the architecture styles of Tenochtitlan, Uxmal, Chichen Itza, and the Toltec capital of Tula are exactly the same. It is believed that following the collapse of the Toltec capital of Tula (1168AD), the Toltecs migrated south and either assimilated into other cultures or conquered them. By all accounts Tula was a magnificent city. Because of the Toltecs excelled in everything, their influence spread throughout central Mexico until every tribe claimed Toltec ancestry(including the Aztecs). The Toltecs were also very advanced, and when they migrated they brought with them their art, architecture, religion, and human sacrifice. The Itza, who were a Nahua speaking branch of the Toltecs, also migrated south, finding their way to Chichen Itza. There is little doubt that the colonization of the Yucatan by the Toltec-Itzas was at first an all out military conquest. This is supported by many murals throughout Chichen Itza, including the mural in the Temple of Jaguars. This mural most explicitly depicts a battle between Mayans and invading forces. In the mural the Maya are defeated. As a result of this intrusion by foreign forces, many new innovations were introduced. These included gold, copper, and turquoise that could be used for a variety of reasons, new ceramics types, and new weapons such as obsidian-edged swords, atlatls slings, and cotton armor. Militarism now entered all aspects of political and religious life. Quetzalcoatl was by far the most important god. However, at this time new gods were introduced such as Tezcatipoca the warrior god, and Tlaloc the god of rain. These were many of the same gods that were later served by the Aztecs. In time, Toltec-Itza influence effected almost every aspect of Mayan culture, and Chichen Itza would remain the center of center of economics, art, and religion for the entire Yucatan Peninsula for the next two hundred years. This was followed by a long period of cultural and political decay. Chichen Itza was abandoned sometime before 900 AD. One of the most important and beautiful structures in Chichen Itza is The Temple of the Warriors, or Temple of the 1,000 Columns. Its restoration was done by the Carnegie Institute of Washington in 1925. During the restoration, they discovered another temple bellow it called the Temple of Chacmool, because a Chacmool was found in one its rooms. This temple looks very much like the Toltec Temple of Quetaztcoatl in Tula. 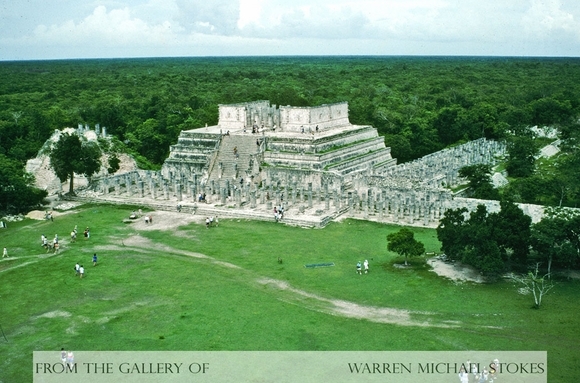 Another equally important structure is El Castillo or the Temple of Kukulcan (Quetzalcoatl). Each side of this pyramid/temple has ninety-one steps, and it is believed that each step represents a day of the year. During equinox of each year this great pyramid casts an enormous shadow of a serpent's head. Recently, over 14,000 people came to Chichen Itza to see this phenomenon. One structure that many historians believe to be purely Mayan is the Observatory. It consists of a large circular tower that rests on two superimposed platforms. It looks very much like the observatories of today. It is believed that this building may have been built during a transitional period, and was possibly started before the Toltec-Itzas arrived. The Sacred Cenote or spring in Chichen Itza has yielded a wealth of artifacts over the past century. This large deep spring was used for human sacrifice, and over the years it has been excavated numerous times. At first they used scuba divers to take out thousands of artifacts, but much was left behind. The next idea was to drain the cenote , but the water kept draining back in. Finally, scientists used chlorine to make the water crystal clear, and this method was successful. Over the years they found tremendous amounts of human bones, sadly most of them from children.